It's been two years since Library Icons 2nd Ed. came out. This is, of course, too long, but things came up as they so often do. This release includes 918 icons in three different formats (Windows, PNG, and OS X), supporting the maximum resolution of Windows (256×256) and Mac OS X 10.5 and 10.6 (512×512). The PNG release is also 512×512. There are also prepared packages for Gnome and GTK, with a KDE version coming soon. As always, if you create something with these icons, please let me know! More details about usage are on the PNG release's download page. 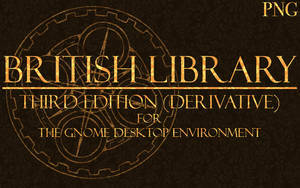 OMG, PLEASE tell me there's a Gnome or Mate theme that goes along with all this awesomeness! I hate to break it to you, but this is a year older than the MATE project. I do have vague memories of working on a GTK2 theme to match, but it was based on a really weird engine that never seemed to work right and I'm pretty sure I don't have the files for it any more. Flat is the way of the present. These icons are wonderful and elegant. I have them installed on my PC, and now I would like to install them on my Android. Could you explain how? I do not know if you need any application to do it. Thank you!! Live folder for your icons rghost.ru/private/8ZcfCK5K9/27… . If you're interested I'll give you the files that you add them to your set. Excellent! Thank you for sharing your hard work! As a Library Page / Librarian Assistant .... this is PURE AWESOME ! ! ! Your wonderful icon set is doing wonders for the look of my new gaming rig. Thank you very much. Gosh. You did good here. Once upon a time! It's definitely starting to show a bit of age, though. Most of the work pre-dates the mobile revolution. I absolutely love your icons. Thank you. Please enjoy this complimentary llama. I tweeted this set, which I am using now for windows vista. Incredible work, gorgeous. Aww, thanks! I'm glad to hear it works out OK on Vista. This is amazing! I'm so downloading this! Yup, you´re welcome. Great stuff. Well, it helps that I was just out of high school when I made most of them. I had an inordinate amount of free time at the time. My process is actually pretty much identical to yours; I think I've just had more experience at selecting base images and manipulating layer styles. 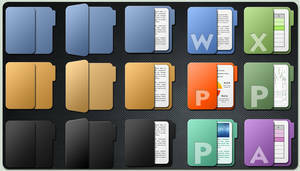 You can see some examples of how I built the paper icons here. I appreciate the response. You have certainly had more experience, I think in total you created close to a 1,000 icons. I am just tinkering! When it comes to the widgets though I do tend to spend a lot more time polishing them. Have you tried any of them? Are they your sort of thing? The 512x512 resolution is the maximum used by Mac OS X 10.5 and later. It makes it a lot easier to have fine control over glows and bevels, although consequentially some of my icons look worse at normal desktop sizes as a result. I gave up on desktop widgets a long time ago, I'm afraid. These days I use a much more minimalist interface where possible. torrent never connects. is this beautiful set dead? Definitely not! I'll see what I can do about that. Thanks for the news. These icons are very nice. Would it be okay to use them in a learning management system for a higher education course? I can't give you a link to the course as it is only accessible by enrolled students and their user ID login. Can't really say no to something that's (effectively) private! I would like to see a screenshot, though, if that's possible, just for my own ego's sake. Thank you. If/when we use any of the icons in a course I will send you a screenshot. Instructions for Windows and Mac OS X can be found in the comments section of each specific version. They're getting kinda dated now—especially the icons for applications—but thanks nevertheless.